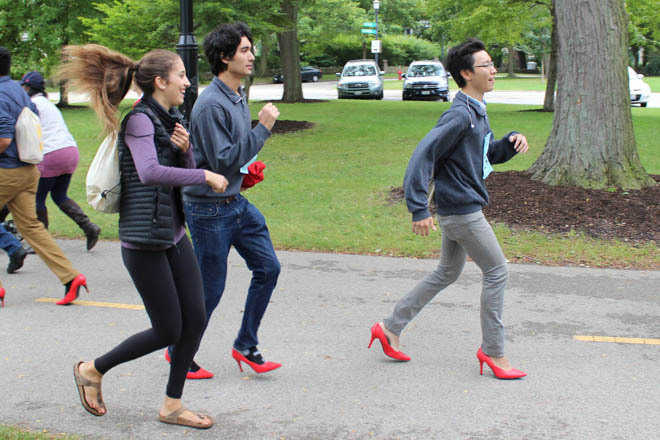 Fathers, brothers, sons, uncles and men from all over the Evanston area ditched their shoes for bright red heels Sunday as the Northwest Center Against Sexual Assault (CASA) held its third annual Walk A Mile In Her Shoes event at Centennial Park, raising awareness of sexual assault as well as fundraising for the Center. The heels were provided by event organizers in order to show sympathy for and solidarity with women who have survived sexual assault, as well as demonstrate the role societal norms play in how we view the issue. Community members and students alike walk a mile in high heels to raise awareness and money to combat sexual assault. 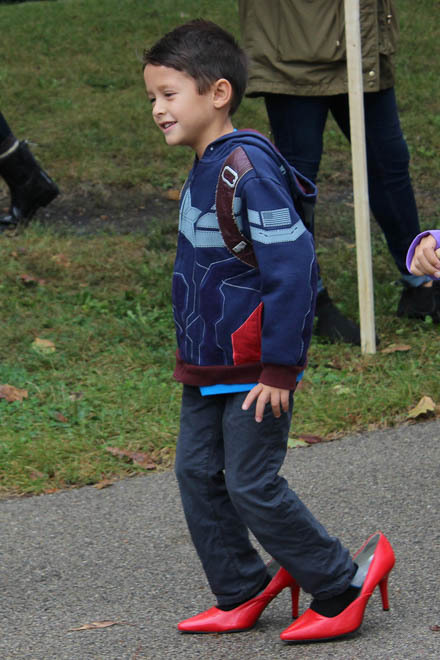 Men and women gathered on the gloomy morning to raise awareness, disregarding gender roles as they walked a mile on the damp lakefront trail in ruby-red pumps. Before the event, Evanston mayor Elizabeth Tisdahl and Deputy Chief of the Evanston Police Department Jay Parrott, as well as Huenink, gave speeches noting the Evanston community’s commitment to sexual assault awareness and prevention. “I think it's especially important that we're all here to raise awareness, and also we need to raise some money for the organizations that help victims,” Mayor Tisdahl said. The event included a diverse array of participants: everyone from Evanston Township High School students, to parents bringing along young children, to the large contingent of police officers in attendance. The Northwestern chapter of Alpha Chi Omega also helped put on the event, and Vice President of Philanthropy Jamie Joeyen-Waldorf talked about the sorority’s involvement in the walk. “We partnered with Northwest CASA, which has a strong connection to the Evanston community, because, as a Greek organization on campus, we’ve always tried to reach out to that connection,” Waldorf explained. The event is a way for Alpha Chi Omega to kick off domestic violence awareness month, and begins a month of programming including the “Haze Play,” a one-woman show free to all students in which a survivor of sexual assault describes her experience with an unresponsive police department, as well as “Purple Night Lights” at the end of the month, when the sorority will hand out purple lights for students to put in the windows of their dorm rooms to show solidarity with those who have been affected by domestic violence. Along with Northwest CASA, which has an Evanston office, Northwestern students can find similar services provided at CARE and CAPS, including counseling, emergency care and support services for survivors. Editor's note: a previous version of this story called October "domestic violence month." This is incorrect. October is "domestic violence awareness month." NBN regrets this error, and made the change at 12 p.m. on October 4.